In this experience, students increase their spelling skills through identifying, explaining, using, and spelling homophones. 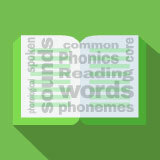 The Student Pack includes links to several digital dictionaries. Identify, explain, spell, and define homophones. Explain the meaning of homophones. Does a king reign or rain? Are clouds filled with reign or rain? In this experience, you will learn about words that sound the same but have different meanings. Discuss student responses. Invite them to define rain and reign. Ask students to explain what the two words have in common as a lead-in to the explanation of homophones in the next scene.